SOLD The Principal Islands of the East-Indies. Explaining what belongs to England, Spain and Holland.. Size: 10.5 x 7.7 inches. Title: ' The Principal Islands of the East-Indies. Explaining what belongs to England, Spain and Holland'. 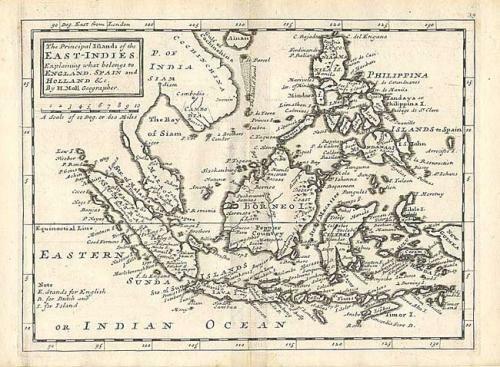 A bold copper engraved chart of the East Indies and the region that includes Sumatra, Malacca (Malaysia), Siam, part of Guinea, and the Philippines. The placenames include Sumatra, Java, Borneo, Celebes, the Banda Islands, Timor, Flores, Ambon, etc. The colonial ownership is indicated. A beautiful, early impression in very good condition. There is a trace of offsetting, else fine.